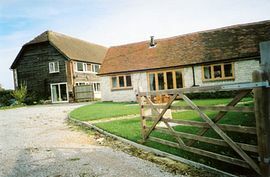 The Dairy and The Parlour both are recently converted farm buildings which are situated at the foot of The South Downs in an A.O.N.B. on the Sussex/Hampshire Border. There are many wonderful places to walk and interesting places to visit for all tastes and ages, for your relaxing break in this beautiful spot of South England. 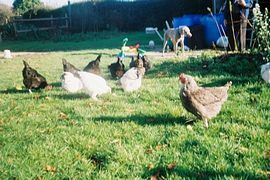 Copper Beeches is a small holding with chickens and ducks, whose free range eggs are available. We also have two rare breed pigs 'Large Blacks' and at the time of writing four cross/breed weaners in the garden. Guests are welcome to visit our livestock and collect the eggs. All Bedding, bed linen and towels included in the weekly price. By arrangement but not allowed to be left on their own. Small garden with patio area. On site parking. Local Services: Bus and Petersfield Train Station is 3 miles away. Come off the A.3 London / Portsmouth road for Petersfield, following the signs for South Harting, once on the B2146 Copper Beeches will be found once you have crossed from Hampshire into Sussex, one mile short of the village of South Harting. (A total of about four miles from the A.3. Low Season: £300.00 per week (approx. January / Easter). 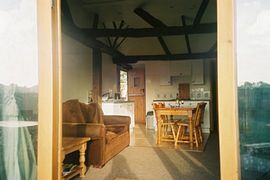 Mid Season: £350.00 per week (approx. Easter / July). High Season: £400.00 per week (approx. August and September). Mid Season: £350.00 per week (approx. October). Low Season: £300.00 per week (approx. November / Christmas). High Season: £400.00 per week Christmas and New Year. Open all year round, short or long stays welcome. "Janet and Ian, Thank you for an enjoyable stay. The Parlour was very comfortable and well equipped. We love the area, so many more things to see and do, will see you again." P. and J. 18th August, 2007 "p.s. we loved the ducks and chickens."